Two quick thoughts about the Florida debate. First, while it was generally too flat and plodding to change any momentum, I think Romney learned something important tonight: He learned that he can provoke Gingrich into spouting all manner of nonsense—what a certain former House Speaker once called “pious baloney”—pretty much at will, just by pressing Newt on his influence-peddling days. No doubt the lobbying/Freddie Mac albatross will continue to weigh down Gingrich, just like the tax-return issue dogged Romney. But, unlike Romney, Gingrich is much too proud or delusionally self-important to come clean. Or even to spin his K-Street CV as anything less than God’s work. Romney has a lot to build on here. Watching Newt was like watching a onetime strongman forced to stand trial for war crimes: It was mostly subdued mutterings punctuated by the occasional outburst that only reminds you how far he is from the height of his powers. 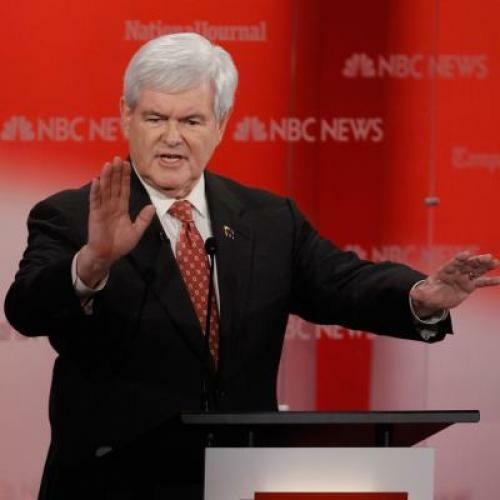 If Newt changes only one thing from here on out, it has to be insisting on real-time applause.